Recycled plastic is an ultra durable material that won't splinter, is graffiti resistant, and requires minimal maintenance. 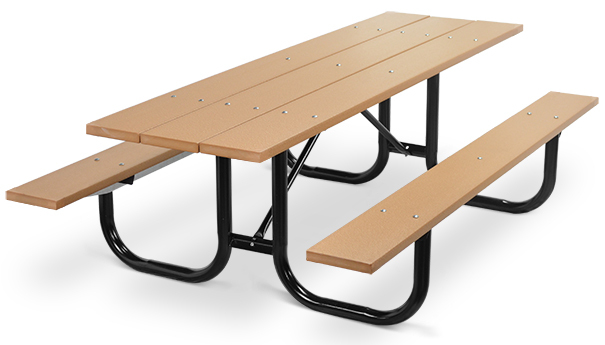 Choosing a recycled plastic picnic table is not only an economical choice for your facility, but it is also great for the environment. 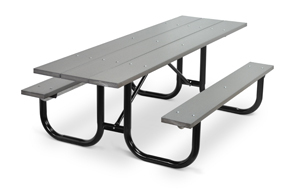 These picnic tables offer walk-in construction and maximum vandal resistance. The 2-3/8" O.D. steel tubing frames are welded for extra rigidity. Frames can be finished with black enamel or hot dipped galvanized after fabrication. 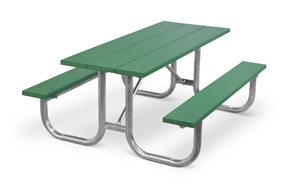 The recycled plastic Park Master comes with a galvanized or powder-coated super structure fabricated from 1/10" (12 ga.) galvanized steel plate. This special reinforcement will easily support the heaviest loads and yet still maintain the integrity of the recycled plastic seats and tops.